Russell Westbrook questions why a foul wasn't called against a Houston defender. Westbrook finished with 40 points, 11 rebounds and 11 assists. 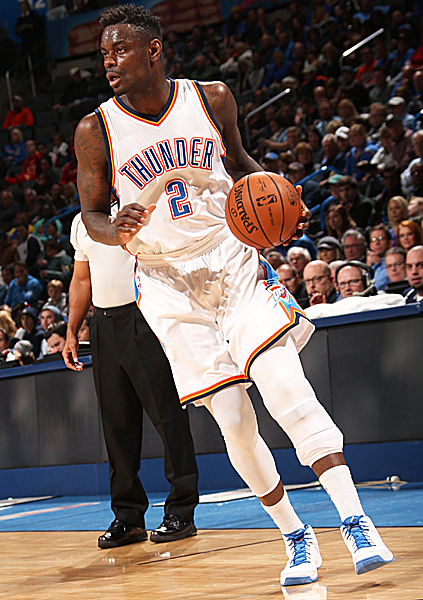 Anthony Morrow had 22 points, four rebounds and two assists against Houston on Sunday. Morrow hit six of eight shots from behind the arc. A missed long-range jumper as time expired left Russell Westbrook and the Oklahoma City Thunder short of a big-time rally Sunday afternoon at Chesapeake Energy Arena. With a 40-point performance and another triple-double in the bag, Westbrook was trying to send the game into overtime, but the Houston Rockets (53-24) and MVP candidate James Harden held on for an Easter Day 115-112 win. Oklahoma City was hurt by its 18 turnovers, eight of which occurred in the first quarter. “We came out with a good start but we turned the ball over too many times,” said Thunder head coach Scott Brooks. “We had a lot of opportunities to finish aound the rim. We just didn’t do a good job of catching and finishing around the basket. Foul trouble, especially with Oklahoma City’s big men, hurt the Thunder’s chances of winning. Steven Adams fouled out in the fourth quarter and backup center Mitch McGary was whistled for five fouls. Oklahoma City fouled Houston 32 times while the Rockets fouled the Thunder 25 times. Oklahoma City (42-35) trailed 93-80 with 8:06 left to play, but the Thunder battled back outscoring the Rockets 20-7 over the next five minutes, tying the score 100-100 with 3:06 remaining. During that time, Westbrook and Kyle Singler each hit three-point shots and Kanter tallied a traditional three-point play. However, Harden connected on two consecutive treys and another two-point bucket before Westbrook hit a three-point shot, leaving the Thunder with a four-point deficit, 108-104. Houston’s final seven points came from the free throw line as Oklahoma City was forced to foul four times during the final minute. Unfortunately, Westbrook missed two free throws that would have pulled the Thunder within two points. Trailing 110-104, Westbrook tallied a three-point bucket, but was forced to immediately foul Jason Terry who was good on two free throws. Kanter scored another bucket, followed by two more free throws by Terry, giving Houston a 114-109 lead. Morrow hit a three-point bucket with five seconds left, cutting the Houston lead to 114-112. Again, the Thunder immediately fouled Corey Brewer who hit one of two free throws, but Westbrook’s final 33-foot jumper fell short. In addition to his 40 points, Westbrook also notched 11 rebounds and 13 assists for his 10th triple-double of the season. Morrow finished with 22 points on eight of 15 shots, including six of eight from behind the arc. Kanter had 21 points and 17 rebounds followed by Dion Waiters with 14 points, four boards and three assists. Houston outscored Oklahoma City 27-17 in the first quarter, but the Thunder won the next three quarters by a combined seven points. Harden finished with 41 points, six rebounds and six assists as two of the three primary MVP candidates combined for 81 points. Harden, Westbrook and Golden State’s Steph Curry are considered the frontrunners for the MVP award. For the third time in the last three games, Oklahoma City was outscored in the paint. This time, Houston tallied 54 points on 27 of 46 shots. Dallas scored 70 on April 1 and Memphis tallied 60 on Friday. Houston’s other top scorers were Dwight Howard with 22 points, Brewer with 14 and Trevor Ariza with 12. Rockets head coach Kevin McHale said his team was fortunate to win. “We missed 19 free throws throughout the game. They (Thunder) had 17 offensive rebounds and we found a way to win. We weren’t as smooth throughout the game. Russell was a handful,” he said. The loss, Oklahoma City’s third in a row, left the Thunder with a ½ game lead over New Orleans for the eighth and final playoff spot in the Western Conference. Oklahoma City hosts San Antonio and New Orleans hosts the Golden State Warriors Tuesday night in pivotal matchups. The Thunder ends a three-game home stand with Sacramento on Friday night. GAME NOTES: The Thunder grabbed more rebounds than Houston, 51-42, including 17 offensive boards. ..However, Oklahoma City also committed more turnovers, 18-10…Houston shot almost 47 percent from the field while the Thunder shot 43.5 percent overall and 46.7 percent from behind the arc.